SKCE Squad Coach, Leon awarded trophies to members of the SKCE 2017 Squad/Team and Sensei Eric presented these at the SKCE 2018 Squad Selection on Sunday 3 December before selection commenced. Since agreeing to be entered for team kumite at the SKDUN World Championships in October 2016, Jodie has throughout this year become a very different competitor in kumite, developing skills and a fierceness we had no idea she possessed, whilst continuing to improve in kata. Dylan has had to deal with a big growth spurt this year (which we’re sure won’t be his last) which has had an impact on his kata as he learns to adjust but he’s someone who is continually striving to improve. Despite not being a fan of kumite to begin with, Dylan has persevered, worked on and applied the techniques Coach Leon has suggested and has not shied away from stepping up to the mat. Ellie has always been very good at kata but this year she has started to develop terrific timing in kumite winning a bronze medal in individual kumite for her age group at the recent FSKA World Championships. Ellie has won a medal at every competition she has entered this year – no pressure for 2018 Ellie! 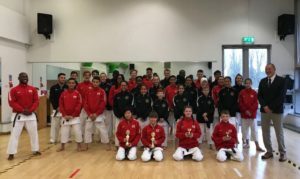 Joshua is a four times individual kata world champion winning two of those titles this year, one at the IJKA World Championships and the other at the FSKA World Championships. Joshua also won a silver medal at the SKDUN World Championships in Hungary in October and together with Ollie and Dmitrijs, he also won world title in team kata world this year at the IJKA World Championships.